The EDTAS series is a key program which helps the Next Generation Technologies Fund future-proof Australian Defence. The series considers expansive science and technology topics that will heavily impact Defence and National Security domains over a 20+ year timeframe. DST is partnering with universities and industry to co-host these events and help shape strategic planning. An EDTAS symposium is a mix of leading edge presentations, thought provoking workshops and keynote presentations. Attendance is via invitation only. The event is live streamed with social media interaction throughout for those who aren't able to attend in person. Topics will be aligned with and help to shape the future priority areas of the Next Generation Technologies Fund. The EDTAS on Space Technologies was held on 5 and 6 March, 2019 in Perth. The Emerging Disruptive Technology Assessment Symposium on Human Biotechnologies will be held in Adelaide on 3 and 4 May 2018. The Emerging and Disruptive Technology Assessment Symposium (EDTAS) on Advanced Materials and Manufacturing was held in Melbourne on the 28-29 November. 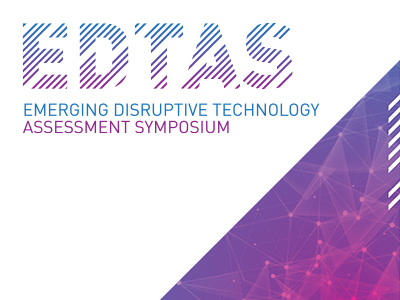 Defence Science and Technology Group in partnership with UTS and Noetic Group hosted an Emerging and Disruptive Technology Assessment Symposium (EDTAS) on Information, Knowledge and Digital Disruption. This Emerging Disruptive Technologies Assessment Symposium (EDTAS) explored the theme of Trusted Autonomous Systems (TAS) and their related technologies to support humanitarian assistance and disaster relief (HADR) missions. The symposium was aimed at understanding and shaping the long term vision for TAS to influence national dialogue and guide longer term investments by Defence.